The revelations, certain to raise a red flag with many Western capitals, come on the backdrop of President Xi Jingping sending his special envoy, Su Hui, to attend Mnangagwa’s inauguration held on Sunday, with Mnangagwa himself set to visit China next month to attend the Beijing Summit of the Forum on China-Africa Cooperation (FOCAC). In 2014, this reporter for the first time revealed China’s plans to set up an underground military base in the Marange diamond fields area in Manicaland, with our then sister publication, The Telescope News. 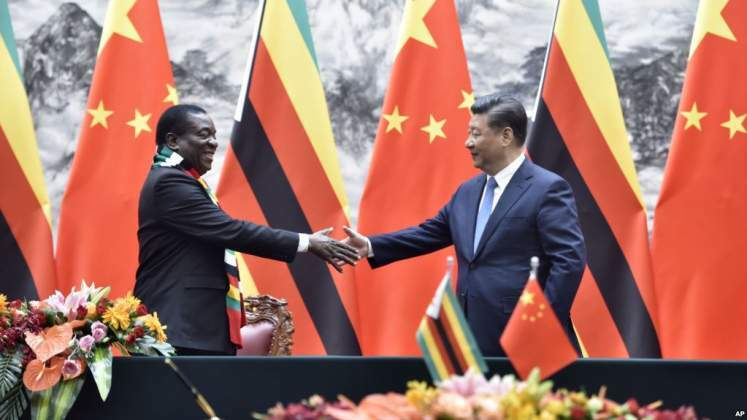 China’s influence in Zimbabwe, is set to grow stronger under Mnangagwa’s term and his deputy, Rtd General Constantino Chiwenga, is also moving to crystallise military partnership with Beijing, our sources said. [A CCTV screen capture shows the model for a new parliament building in Zimbabwe. Photo: Handout] Proposed new parliament building, to be built in Mt Hampden, Zimbabwe’s soon to be new capital city. “Your VP (Chiwenga) is the main actor moving things militarily with China, with the blessing of Mnangagwa,” said a former envoy from Scandinavia who was based in Harare a few years ago.